It was my second visit to Gardens By The Bay in Singapore. The year was 2013. It was Christmas eve. My friend and I boarded the Aeroline bus (in front of Corus Hotel in Kuala Lumpur) which departed at 8.35am and reached Johor Bahru about 4 hours and 15 minutes later at 12.50pm. In case you are wondering how I could possibly remember the time so accurately, that's because I noted them down. You see, I carry a travel notebook (good old-fashioned paper notebook, not a laptop!) with me during my travels. I also try to take photos of everything. Of course not every photo will end up in my blog posts. Look! 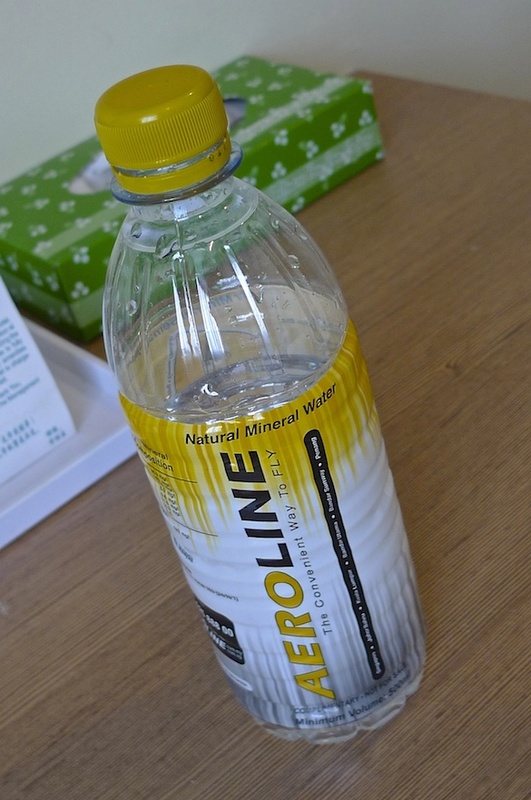 I even took a photo of the complimentary mineral water bottle from Aeroline after we checked into our hotel room in Johor Bahru. Haha! Yes, we decided to stay at a hotel in Johor Bahru instead of Singapore to save costs. I chose AmanSari Hotel City Centre again because of its reasonable price and its close proximity to the CIQ (Customs, Immigration and Quarantine Complex). Read my review about this hotel during my first stay back in 2012 HERE. I absolutely love their Unifi-high speed wireless broadband! We were given a code to access the Internet. After checking in, my friend and I went for lunch at Breeks Cafe in City Square Mall which is just a stone's throw away from our hotel. So very convenient! I think we wasted too much time enjoying our lunch and walking around the mall that we did not realise time had passed by so fast. It was already almost 3pm! We quickly searched for a money exchange shop to buy some Singapore Dollars. Then off we went to Singapore! If you would like to know how to cross over from the Johor Bahru CIQ to Singapore via buses, read THIS. Since half the day was already gone, our itinerary in Singapore had to be limited to just Gardens By The Bay. In fact, it was already 4.30pm when we reached Gardens By The Bay. I wasted no time in taking photos. We walked along the wooden boardwalk facing Dragonfly Lake. That's the Dragonfly Bridge which connects the Gardens to Marina Bay Sands, where the casino is. The tall Supertrees could be seen clearly here. I remember how excited I was seeing these Supertrees the first time. This round, I was not so excited anymore, but they were still fascinating. Read about the Supertrees HERE. A large rock, artfully designed and complimenting the surroundings. Love it! In the distance are the two cooled conservatories - Flower Dome and Cloud Forest. These are indoor attractions and they require ticket admissions. The outdoor gardens which I was walking on is free. This round, I did not enter the two cooled conservatories. But I highly recommend first time visitors to visit them as they are pretty cool. Read about my visit to the amazing Cloud Forest with the world's tallest indoor waterfall HERE. Or if you are more into plants and flowers, read about my visit to the Flower Dome HERE. There were information boards around the lake. I did not spot a water lily though. There were not many tourists or local visitors during my visit. Perhaps it was Christmas eve? 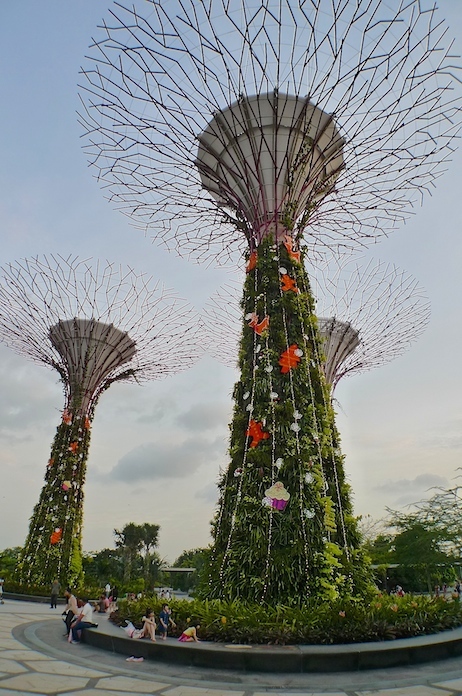 Now you know the perfect time to visit Gardens By The Bay if you don't like crowds. Haha! Took a snap of the Marina Bay Sands. Notice the top part of this unique building? That's the Skypark where the longest infinity swimming pool in the world is located. I did not visit it this round as time was limited. Read about my visit to Marina Bay Sands and the amazing Rain Oculus HERE. As we walked along this path, we could see the Singapore Flyer from here. Did you know the Singapore Flyer is the tallest Ferris Wheel in the world? OK, another shot of Marina Bay Sands. Can you see the giant dragonfly? We stumbled upon an art sculpture in the middle of nowhere. Nice. This is one of the many sculptures located all around the Gardens, although if you have read my previous post, I was really searching for the Floating Baby. Please excuse me, but I just got to take more pictures of the Marina Bay Sands. LOL! Love the sense of calmness and tranquility these pictures evoked. The Supertrees and their images reflected by the lake. We were walking in this direction and I was again busy taking pictures of the famous building when we saw some weird looking structures on our left. A row of weird structures all the way up. Near the top looking downwards. The structures were all in the middle of the water stream flowing down towards the lake. They actually looked kind of futuristic especially when you combine with the Marina Bay Sands in the background, although I have to admit that my pictures simply cannot do any justice to them. I think my video shows these structures clearer. Check out my Instagram video of these structures and the flowing water HERE. 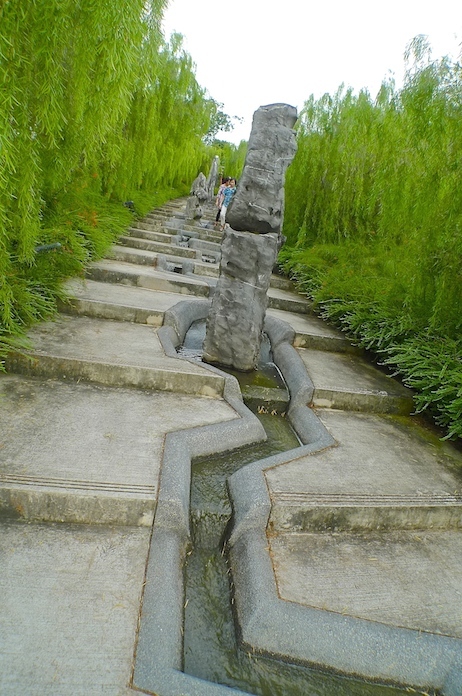 The steps led us up to the Chinese Garden. A hole in the wall surrounding the Chinese Garden. This is the Chinese Garden but I did not take many photos. After exploring the Chinese Garden, we walked back down towards the lake. Then we crossed over to The Meadow. It was here that I got quite a shock seeing the huge Floating Baby. I finally found what I was looking for! 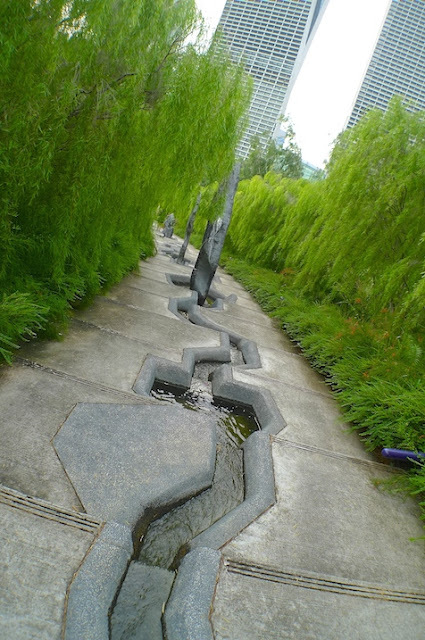 This must be one of the most amazing art sculptures at Gardens By The Bay! I have already blogged about this Floating Baby - you can read it HERE. After that, we walked and came across this place where plants were trimmed to shape like animals. There were more of them but I did not take pictures of them all. 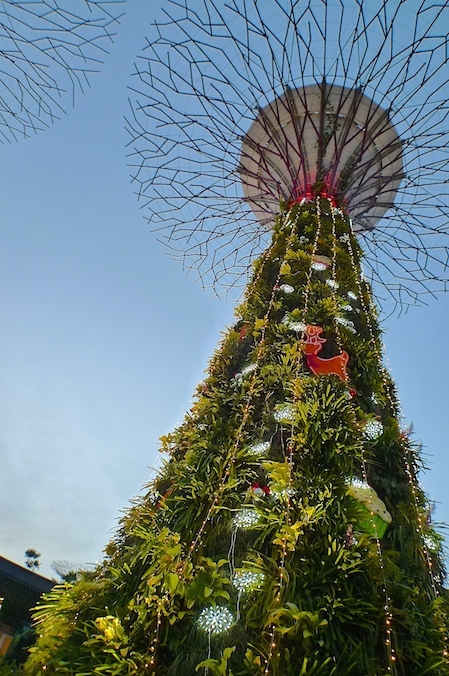 It was Christmas eve and the tall Supertrees at the Golden Garden were decked with Christmas decorations. The sun was already setting and so the lights came on. My friend and I walked over to the Supertree Grove to catch the Spectacular Light And Sound Show. There are two shows nightly, at 7.45pm and 8.45pm. At night the Supertree Grove is transformed into a fairytale land! We caught the 7.45pm show. It lasted about 20 minutes I think. Pretty good with the lights blinking and dancing to the music, but not really amazing though. Still, I was glad I caught the show. In fact, the Floating Baby and this Spectacular Light And Sound Show were my main purpose for revisiting Gardens By The Bay since I missed them the last time. 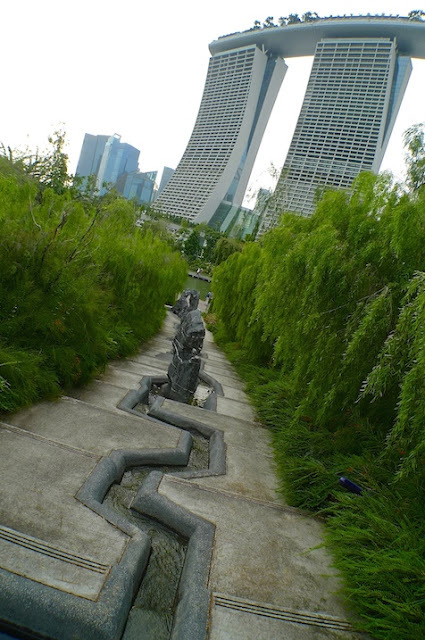 Will I visit Gardens By The Bay again in future? Yes, why not? I had enjoyed it the first time, and it was still enjoyable the second time.